Germany and the Netherlands form a joint task force. A brigade of Dutch paratroopers will be integrated into a new German division of rapid reaction forces, German newspaper Rheinische Post reported on May 22. The 11th Airmobile Brigade—a mobile force of 4,500 troops that is equipped with light vehicles, mortars and anti-aircraft systems—will join 8,600 German soldiers to form the new division under German command. 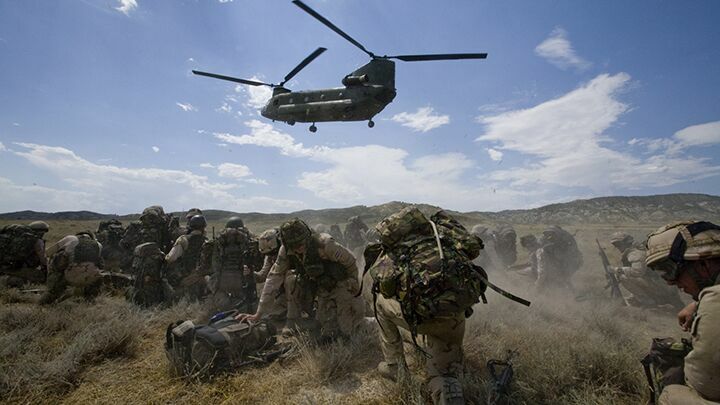 With paratroopers and special forces, as well as combat and transport helicopters, the group is designed to respond quickly to new threats and help evacuate endangered German and Dutch citizens. Until now, only Britain and America had a similar type of military structure. The Dutch brigade could be deployed anywhere in the world within 20 days. The new force will presumably have a similar sort of response time. The Dutch De Telegraaf newspaper revealed that drastic cuts to the Dutch military budget were partially responsible for the merger. The Dutch forces won’t leave their bases in the Netherlands, but the joint procurement and training with Germany will save money. The merger is seen as a major step for the Netherlands. However, the Netherlands has only one Airmobile Brigade. If it needs to deploy troops in a hurry, it will only be able to do so with German cooperation. This is not the first Dutch-German initiative. The I. German/Dutch Corps is made up of one Dutch and one German division. The corps is a high-readiness land force designed to be able to deploy within 20 to 30 days. Many nations, particularly Britain, have been reluctant to pool their military resources. But with Britain shifting toward the fringes of the EU, military cooperation among the other states is becoming more feasible. The new merger shows how Europe’s economic troubles could revolutionize its military. All across Europe, nations are under heavy pressure to cut budgets. Politically, it is easier to cut military budgets than many other areas of state spending. Cut the defense budget, and people grumble. Cut social spending, and they riot. At the same time, European nations are keenly aware of the need for military spending. They see the spread of radical Islam in northern Africa, and the retreat of America. French President François Hollande committed to keeping France’s defense budget at €30 billion (us$39 billion) a year, despite calls to cut it. That’s not too surprising, since the nation just spent an estimated €205 million (us$265 million) in Mali. The pressure on leaders like Hollande will get stronger. In a way, military pooling is a win-win scenario. All the nations involved get to cut their costs, while the resulting army is stronger than the sum of its parts. Ten battalions, 1,000 strong, from 10 different countries cannot be as effective as one division, 10,000 strong, provided the division is well-integrated. Not only can the larger division work better together, but all the support staff can be organized much more efficiently. As the economic crisis bites, we will probably see more EU countries “go Dutch,” heading toward forming a common European army. The big downside is the loss in sovereignty. But the Netherlands’ decision to place its rapid reaction forces under German command proves that EU nations will, under some circumstances, accept this. The new brigade could even be a proof-of-concept—a baby step toward much closer cooperation. Watch for the EU, or a group of EU nations, to work toward a common European army.